We've been discussing RavenDB on this blog. 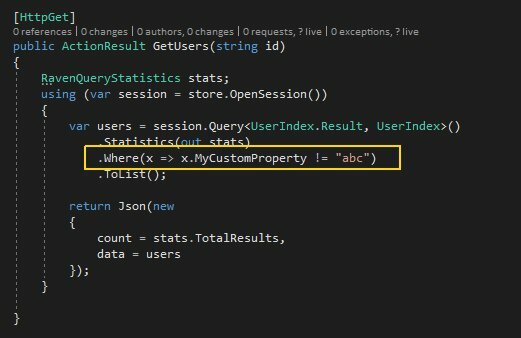 On this post, I want to address a feature that's commonly asked: how to query metadata in RavenDB. using a dynamic: using dynamic indexes in the studio. Query the indexes, using the metadata property as if it were a normal property. Simple enough, isn't it? This is the best option as your data will be always searched using the index causing minimum stress to your database. So, using the below Lucene query allows you to query a document's metadata using RavenDb. Just remember to select the dynamic index. In this case, I'm using the dynamic/Users index. On this post I tried to show a few ways to query metadata. Hope it helps.